Earl Biss, Absaroke (Crow), was born September 29, 1947, in Renton, Washington; he was raised by his grandmother at Crow Agency, Montana, and at Yakima, Washington. He contracted rheumatic fever at age eight and instead of the usual boyhood activities, he started drawing and painting. 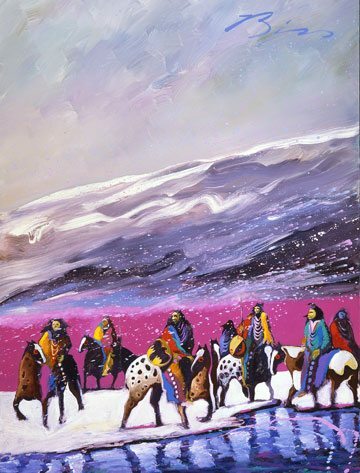 Biss’s first oils were done at age twelve, but his formal training did not start until age sixteen at the then-new Institute of American Indian Arts in Santa Fe, where he studied jewelry and three-dimensional art from 1963 – 1965. After graduation, Biss received a scholarship to the San Francisco Art Institute where he studied oil painting. As an artist, Biss expressed much of his emotional turmoil, embodied by his mystical, melting landscapes and people, while still admiring and studying old European masters. As a student of Fritz Scholder at the Institute of American Indian Arts in Santa Fe, he was exposed early in his training to the style of Abstract Expressionism as a creative and emotional outlet. As an Absaroke (Crow) Indian artist and benefactor, he was admired for his professionalism, business sense, and compassion for the Absaroke people. The invisible energy contained in nature is perhaps Biss’s subject, and he translated this invisible energy into abstraction on his canvas. His technique resembles the spirit of nature in its freedom with fluid movements, layering, and non-ending rhythms. Biss differed with the Abstract Expressionists by admitting that his paintings began with ideas, while most other Abstract Expressionist painters began with the process of painting. When Biss created images, that same force of nature was present. 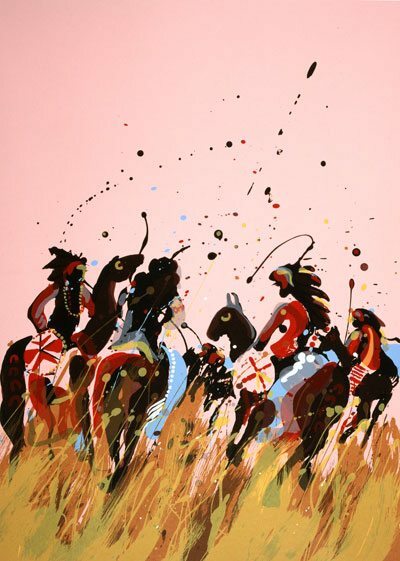 He said that he “loves to move paint” and was primarily concerned with the medium, but he dealt with the commercial reality of painting Indian subjects. He said that he did his best work when he was dealing with something about which he felt deeply and knew more intimately than the ideas behind experimental art that originated in New York and Europe. Biss painted on the Greek island of Corfu for six months and credited the Old Masters such as Turner, the Fauvists, and Munch, along with Pollack and de Kooning, as creative influences. On October 15, 1998, he died from a stroke while in his studio painting. 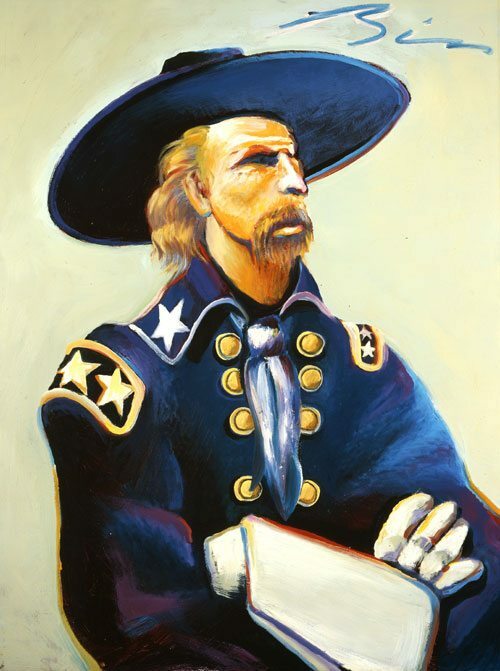 Earl Biss’s works in the Buffalo Bill Center of the West include General Custer in Blue and Green, Mountain Warriors before the Storm, and Parley. Broder, Patricia Janis. The American West. Boston: New York Graphic Society, 1984. Highwater, Jamake. Song From the Earth: American Indian Painting. Boston: New York Graphic Society, 1976. Prepared by Whitney Gallery of Western Art, Buffalo Bill Historical Center, Cody, Wyoming, April 20, 2001.